Video collection: Super slim MeeGo Netbook at 199usd/120GBP from ASUS! 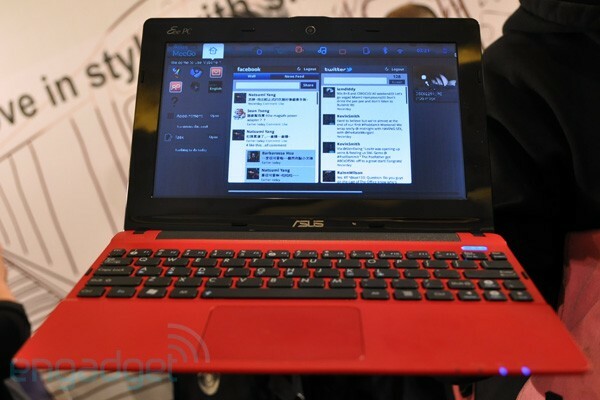 ASUS – the creators of the netbook have announced their latest super slim 17.6mm (at the thickest point), 950g 11″ netbook. The price? Engadget’s Vlad calls it “groundbreaking” at $199. Yes, $199. £120. That’s ridiculous! Best of all for you guys, it’s running MeeGo! MeeGo really is perfect for netbook. It does the core basics that you’d want from a netbook and more if you wanted to push it. I wonder what MS thinks about Nokia’s child that could have nearly killed the software giant if it grew up fast enough (at least on netbook/tablet/phone arenas – OH the missed synergy between MeeGo products…could have been mega awesome). It comes in scarlet red, chocolatey brown, and white (with glittery tops). Not sure there are more colours, I’m seeing different colours with different videos. ASUS EEEPC X101. You have the option of going Windows if you want. ASUS are really doing a lot of attention grabbing. The Padfone (it’s basically the Palm Foleo revived), the Transformer (I’m really considering getting one actually. Netbook, tablet in one package) and now this.